It takes a conference like last week’s Nevada Governor’s Global Tourism Summit or a stocking stuffer like author Deborah Wall’s “Base Camp Las Vegas” to reaffirm that casinos and nightclubs aren’t the only offerings in Southern Nevada’s repertoire. The Nevada Division of Tourism is funded in part by revenue generated by hotel room taxes, but most of its promotional might is focused on promoting rural parts of the state. The Nevada Commission on Tourism’s marketing and advertising campaigns are centered around a “Don’t fence me in” theme that invites visitors to go outside and wander down the back roads of the Silver State. That’s also the message the commission’s contracted representatives all over the world send to potential customers. Everybody wants foreign visitors because they spend more time here — and more money — when they visit. Tourists are encouraged to take in the shows, the restaurants, the shopping, the gambling and the nightclubbing when they come to Las Vegas. But the commission also wants them to see the rest of the state. 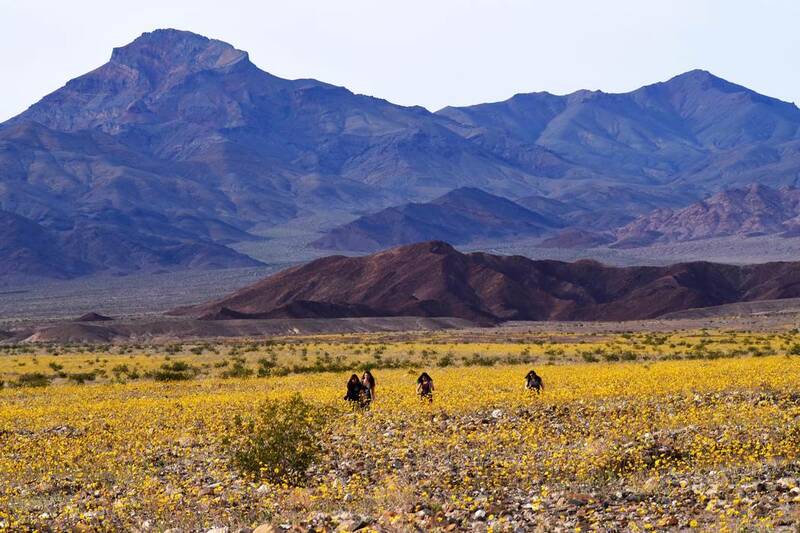 Wall, a contributing columnist with the Review-Journal’s sister View publications, has long seen Las Vegas as an ideal jumping-off point for 101 hikes in the Southwest. Her book, which hit shelves in August and is available at Amazon, Barnes & Noble, downtown’s The Writer’s Block bookstore, Red Rock Canyon National Conservation Area, Desert National Wildlife Refuge and Desert Outfitters in Boulder City, is an addendum to an edition published in 2010 with updated information and 41 more hikes. “A lot of people don’t realize that we’re absolutely so centrally located to some of the finest country in the world, including Zion, Grand Canyon and Death Valley (national parks),” she said in a recent interview. The basic criteria for “Base Camp” is to describe hikes with maps and photos of destinations within about a half-day’s drive of Las Vegas. There are 23 hikes at Red Rock Canyon, Mount Charleston and Lake Mead alone with other trips as far away as Great Basin National Park, Utah’s Zion, Bryce Canyon, Grand Staircase-Escalante, Capitol Reef, Canyonlands and Arches, Arizona’s Grand Canyon, Antelope Canyon and Monument Valley and California’s Mojave National Preserve. Wall has cross-referenced hikes to match easy trips for children or adults with limited mobility, teen favorites, solitude and remote adventures, waterfalls, streams and wetlands, remarkable geology, wildflowers, petroglyphs and pictographs and locations best visited in the summer at high elevations and winter in the low deserts. Some hikes are easy with walks of less than half a mile on level ground, while others are more grueling, like the 26-mile rim-to-rim hike in the Grand Canyon. Wall is also interested in learning more about one of Nevada’s newest state parks, which Gov. Brian Sandoval described in detail at last week’s tourism summit. The Walker River State Recreation Area is 12,000 acres along 28 miles of the east fork of the Walker River near the Nevada-California border. The park, expected to open next year, incorporates the donated Pitchfork, Rafter 7 and Flying M ranches along the river and will offer camping, hiking, biking, wildlife viewing, nature study, outdoor education and fishing. Some of the new camping areas will be accessible only by canoe or kayak. The new Walker River park will appeal not only to Nevadans seeking new adventure, but to the Europeans, Asians and Latin Americans visiting our country in search of outdoor adventures as well a resort experience. And maybe the new park will require another revision by Wall for “Base Camp Las Vegas” with a few new book chapters.